On the morning of Monday 30th July 2018 Master Horan, Mr Owen, eight competitors and 5 parents all started our long journey from Hertfordshire and Bedfordshire to Buenos Aires in Argentina for the World Championships. The journey took around 24 hours in total, landing in Argentina on Tuesday 31st July at 7am to a chilly 1 degrees; none of us were truly ready for the cold and instantly started to apply layers. We were promptly picked up from the airport along with others from Team UK who also flew out from Heathrow, including the Dutch team who we met on our layover in Amsterdam. We were taken to our hotel Cyan de las Americas in the centre of Buenos Aires by coach, and had breakfast which was much appreciated after our long journey. After settling into our hotel rooms and quick showers we went off for an explore of the local area and our home for the next week. We decided to go to a famous cemetery called La Recoleta Cemetery, this is a huge cemetery located in the centre of Beunos Aires and it is where famous people have been buried. It contains the graves of presidents of Argentina, Nobel Prize winners but for us we wanted to see the grave of Eva Peron. If you are unsure who she is, Madonna played her in Evita, with the famous song Don’t Cry for Me Argentina. As well as looking at graves we also stocked up on supplies for the rest of the week; mainly water, sports drinks and snacks to keep us going during the competition, before heading back to the hotel for weigh in at 3pm. All competitors from Team UK weighed in successfully with no major concerns; it was now time to fuel up with food, and what better way than with a true Argentinean pizza, basically this means a thick base, plenty of toppings and lots of cheese. After filling our bellies with pizza and a walk back to the hotel it was time for an early night ready for the first day of competition in the morning. Day One Wednesday 1st August dawned bright and early as coaches were collecting the teams at 8.30am. We arrived at the venue the Tecnopolis Estadium in plenty of time ready for the opening ceremony. The venue was huge; we found out later that it was a science and art venue where families would spend the day exploring. The first thing that we all noticed however was just how cold it was inside the venue, honestly it was warmer outside, and we all started layering up with hoodies, leggings, extra socks and extra tops, during the week some people even started to bring blankets from the hotel rooms to keep warm with. By day three they eventually got the heating fixed and the venue was so much warmer. The opening ceremony was bright and loud, with a vibrant performance from a drumming dance group, finished with fireworks on stage and a glitter bomb which was still being cleaned up at the end of the week! Noah, Ellis and Declan were chosen to hold the England flag; all three looked superb in their Team UK tracksuits (the envy of many other countries teams as they kept trying to swap with us on the last few days). With the competition officially started people started to get warmed up. Up first from the UTA was Noah in the pre-junior sparring for micro weight. He had some tough spars and won a well deserved bronze at his first international competition. Up next was Greg for the Senior 3rd Degree Male Patterns, he won his first two rounds getting him into the semi-finals, unfortunately missing out on a place in the finals to an Argentinean, but winning a bronze. Declan was up for 1st Degree Under 14’s Male Patterns today too, he performed his patterns well, unfortunately he didn’t get through his first draw. The day came to a close at 6pm, and we went for dinner at a steak house. The food was amazing! Day Two Thursday 2nd August, we all arrived at the venue in many layers to keep us warm on the long day ahead of us. As the schedule was running behind we had some catching up to do. On today were Greg, Ellis, Declan, Elliott, Leighton and Kelly. Ellis performed his 1st Degree Under 16’s patterns perfectly and we all thought he had it in the bag, unfortunately the vote went the other way and he lost to the eventual winner of his division. Kelly also had 3rd Degree Adult Female patterns today, again performed well but lost of the first round to one of the medal winners. Leighton competed in 2nd Degree Under 16’s Male Patterns, again another brilliant performance but unfortunately he was knocked out. Elliott competed in 3rd Degree Adult Male Patterns too, he won his rounds to get a spot in the final up on the centre ring to be filmed for Argentinean TV later in the evening. Declan was up again today for U14’s Welter Weight Male Sparring, he worked really hard and gained lots of experience as well as a bronze medal. Greg too had Senior Male Middle Weight Sparring today, he got through his first spar into the semi finals where he missed out on the final but won a bronze. In the evening on the main centre stage Elliott performed in the Adults Male 3rd Degree Patterns against a Russian. He did amazingly well, and again we all thought he had won it, however the votes went the other way and Elliott won a well deserved Silver. It was a busy day two of the competition with nearly all UTA competitors doing something. With a late night back to the hotel it was a quick meal down the road and an early night to bed. Day Three Friday 3rd August, another early start to get to the venue for the third day of competition. Today was set to be a busy day with team and adult sparring. Unfortunately with the delay in scheduling we were behind. Leighton was up today with U16’s Male Micro Weight Sparring. He did really well and got through to the semi finals winning a bronze. Junior teams performed today earning places in the finals, along with many Team UK under 18s getting into sparring finals too. We also watched the special needs Taekwon Do competition. Today was a really long day, which carried on later than expected with the medal ceremony. Luckily we could have a lie in the next morning as the competition was starting at 12pm. So for dinner we went back to the steak house, where a few people ate intestines, a delicacy in Argentina! Day Four Saturday 4th August, after a lie in and a later start we all arrived at the venue a bit more refreshed and ready for the long day ahead of us. Kelly was up today in Adult Female Middle Weight Sparring. After two tough fights she got into the final, which was to be held on day five. Kelly also performed in the team patterns today, unfortunately after performing the best team patterns they had ever done; they were knocked out by Team USA and didn’t get a place in the final but won a bronze. It was another long day with a late finish, but again a lie in the next day with the competition starting at 12pm again. After a delicious dinner of pasta, pizza and birthday cake to celebrate Noah and Leighton’s birthdays it was off to bed to rest up for the final day of the competition. Day Five Sunday 5th August, after a relaxed morning resting up, stretching and practicing team patterns we were all back on the coaches for the final day of the World Championships. Today promised to be a busy day for both individuals and teams. Up first was Kelly in team sparring against the USA team, the team sparred really well, winning three matches and getting into the final against Argentina later in the evening. Elliott was also up against the USA team in the Team Patterns; unfortunately they missed out on a place in the finals and won a bronze. The male team did get into the Team Sparring Final against Argentina later on in the evening also. Kelly was up next for her final in Sparring against an Argentinean, it was a tough spar for Kelly, but she put all her training and preparation into practice and won the Gold for her division, earning the title World Champion! Adam was up in the Adult Male Breaking having waited all week; unfortunately he didn’t make the qualifier and could not continue in the competition. A quick break in the schedule for the closing ceremony, the tango, and the final events got underway on the centre stage. Kelly was up again in Team Sparring against Argentina in the final. After five fearsome spars it ended with Team UK and Argentina drawing. So one more round of one minute happened. Kelly sparred well, and missed out on Gold in the last seconds of the spar, winning the team a hard earned Silver. Elliott was also in Team UK for the male sparring, against Argentina too. They also had some truly tough fights and missed out on the gold medal earning silver. After a long day and with the competition finishing later than expected it was time to wind down with a late evening meal before the long flight home the next day. 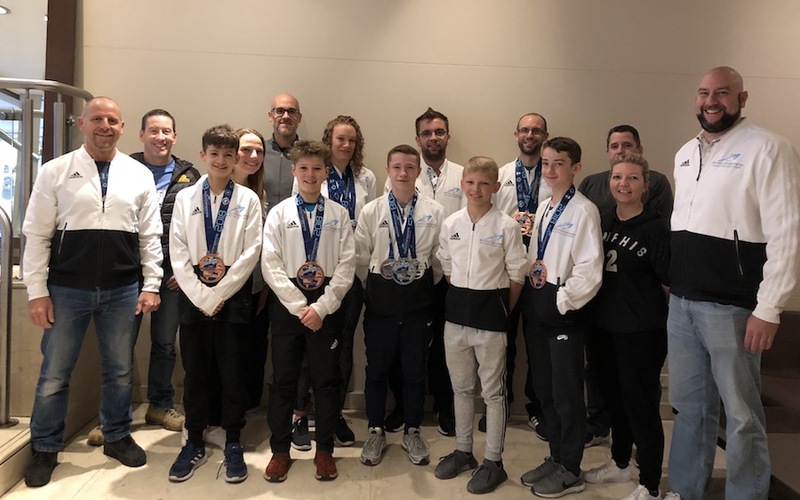 So after five days of fearsome competition between many countries, the eight competitors from the UTA came home with a grand total of 11 medals between them. Well done to all who competed, even if you didn’t medal the experience that you gained is invaluable. A huge thank you must go out to the parents who also came out with us. You cheered us all on, looked after us and made sure we were all well. All the competitors are very thankful to you all. Also not forgetting Master Horan and Mr Owen, without whom none of this would have been possible. You have trained us all over the past year, in preparation for the Nationals in October and February, the Finals in March and finally for this last competition The World Championships. We are all truly thankful for your time, experience and attention to our training on the run up to the Worlds, but also to your coaching on and off the mats. Thank you.